The most elegant First Ladies that I remember are Nancy Reagan and Laura Bush. They were the epitome of grace and class. Melania Trump is by far the most beautiful First Lady in memory. She rivals Jackie Kennedy and I would say that she is even more beautiful and elegant than Jackie was. She is simply stunning. Melania is a quiet woman who does not seek the limelight for herself. She is a mother first and the First Lady second. In a surprising turn of events, Melania is featured on the cover of Vanity Fair Mexico. She is described as “the new Jackie Kennedy” and it fits. 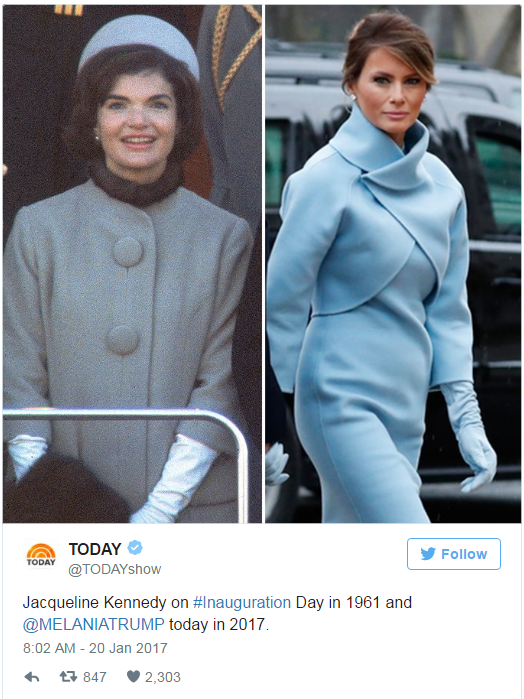 If you watched the Inauguration, you will forever remember the powder blue outfit the First Lady wore that day with matching gloves. Her hair was swept up and her presence literally eclipsed everyone around her. 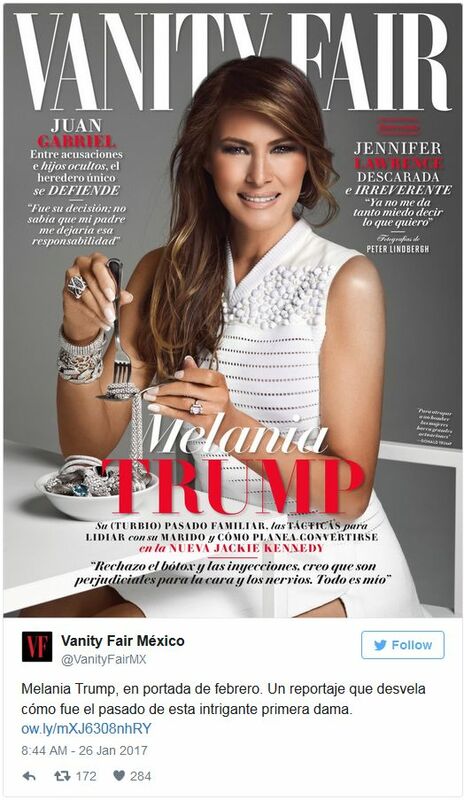 She is on the cover of the Mexican magazine even as President Trump battles with the Mexican president over the border wall. They came to a sort of detente earlier today, but things are still very tense. First lady Melania Trump is on February’s cover of Vanity Fair Mexico, with the description “the new Jackie Kennedy,” even as her husband and the Mexican president engage in a Twitter war. The article is based on an interview and photo shoot Trump did for GQ Magazine last spring. GQ and Vanity Fair Mexico are owned by the same corporate parent, Conde Nast, according to ABC News. The cover teases that the article will go into her intriguing past and her current life with Donald Trump. 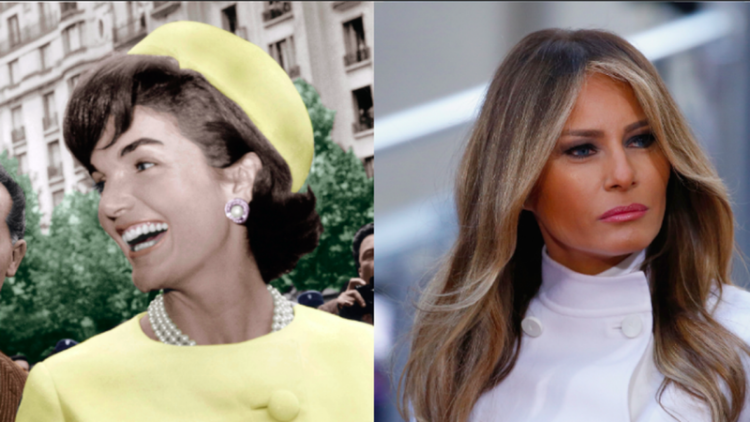 “In fact, in a now-prophetic 1999 interview with The New York Times, Melania — then dating Donald Trump — said she would see Kennedy as a role model should she ever make it to the White House as first lady,” CNBC reported. Melania Trump is originally from Yugoslavia and was a professional model. Now, she is married to the most powerful man on the planet. She is the second foreign-born First Lady of the United States, following Louisa Adams in 1825, and the first who is a non-native English speaker. I believe she speaks eight languages. She definitely has had an intriguing life before and after her marriage to President Trump. Donald and Melania Trump were married in 2005. They have a son together, Barron Trump, who is ten years-old. Just how the Vanity Fair article will be received in Mexico, given the current strained relationship between the two leaders, is not clear, but Americans are giving the First Lady high marks. In fact Melania and Ivanka are extremely popular among Americans. A poll released this week finds 47 percent are already holding a favorable opinion of Melania, while 32 percent have an unfavorable view, with the rest still getting to know her. But I wouldn’t be surprised if that poll is skewed. The new First Lady is an icon to Americans and the world. Beauty and class have returned to the White House at long last.